Two years after introducing the Warrior and Invader lineup of accurate, high-quality entry-level crossbows, Wicked Ridge Crossbows has decided to step up its game with the new high-performance Raider CLS. The Raider features an economically executed variation of parent company TenPoint’s powerful Compact Limb System (CLS) bow assembly. Unlike TenPoint’s one-piece CLS riser and foot stirrup, however, the Raider is designed with a detachable, lightweight coated aluminum foot stirrup. Its 12-inch IsoTaper Limbs are fitted with MR cams and ultra-strong D-75 string and cables. Together, these features create a smooth-handling, high-performance crossbow that drives a 20-inch arrow at 330 fps with 101.6 ft./lbs. of kinetic energy. With its new CLS bow assembly and injection-molded composite semi-skeletal Verton stock and ACRA-ANGLE barrel assembly, the Raider weighs in at 7 pounds. In addition, the stock is fitted with a safety-engineered winged fore-grip designed to keep the shooter’s fingers below the rail in any shooting situation. The Raider CLS comes equipped with a TenPoint 3x Multi-Line Scope and, like all Wicked Ridge models, features TenPoint’s patented DFI™ (dry-fire-inhibitor) and patented 3 ½-pound PowerTouch trigger. Equipped with the patented ACU-52 cocking system, the Raider CLS is double-dipped in Mossy Oak’s Break-Up Infinity® camo pattern. MSRP: $799. More information at www.wickedridgecrossbows.com. 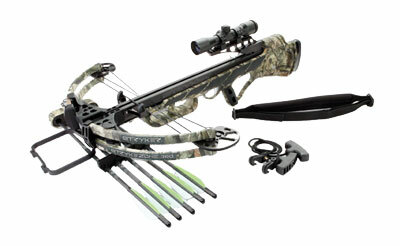 Stryker Hunting Crossbows is continuing with its StrykeZone line of crossbows that were introduced late in 2011. Driving arrows at 380 feet per second, the StrykeZone 380 is the fastest member of the high-performance StrykeZone collection. Stryker’s unique piston design allows the trigger pull to be independent of the bow’s holding weight. Combined with a double sear, this ensures an ultra light trigger pull. The double jaw string capture protects the trigger mechanism from the elements, promising a clean release in any weather, according to Sam Coalson, company spokesman, who said the KillSwitch trigger has less than 3 pounds of pull and a fraction of an inch of travel. The StrykeZone 380 comes equipped with Octane string and cables and precision-engineered cams. The bow measures 19 3/16 inches axle to axle with a 15 ½-inch power stroke. Draw weight is 160 pounds, generating 123 ft./lbs. of kinetic energy. The Stryker line includes the Auto-Flip magnetic safety that clicks into the safe position every time the bow is cocked and is engineered to click back into safe mode if the crossbow is dropped or the bolt is removed. The Cease-Fire safety plug is a double barred insert that slides into place, locking the jaws and immobilizing the trigger until the shooter removes it. The StrykeZone 380 is available in Mossy Oak Treestand. 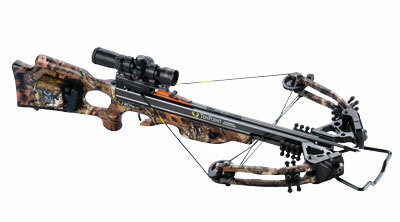 The Stryker 380 GameOver package includes five 385-grain matched Stryker arrows, five-arrow quick detach quiver, 4X multi-reticle scope, detachable sling, cocking aid and string stops. MSRP: $799. More information at www.strykerxbow.com. TenPoint Crossbow Technologies married the woven carbon fiber barrel technology from last year’s revolutionary Carbon Fusion CLS to its growing lineup of streamlined XLT (Xtreme Limb Technology) crossbows to create the new Carbon Elite XLT. Fastest and lightest of the popular XLT group, the Carbon Elite XLT’s bow assembly measures 13 ½ inches axle to axle when cocked — slim enough for still-hunting through standing corn. The riser comes with a detachable, lightweight, coated aluminum foot stirrup. Its 11-inch IsoTaper limbs are double laminated for improved strength and durability and are equipped with TenPoint’s new MRX cams, as well as D-75 string and cables. Combined, these design features produce a 185-pound draw weight that propels TenPoint’s new Pro Lite™ carbon arrows at a blistering 352 fps. TenPoint’s ultra-light wrapped carbon fiber barrel was created in response to the market’s demand for a lighter and quieter crossbow with a “second shot” capability. The barrel, fitted with threaded aluminum rivet nuts, “floats” inside the stock to further reduce noise and vibration. The XLT also features an extruded aluminum trigger mount fitted securely inside the rear of the barrel cavity. In addition, the XLT’s flight deck has an extremely low coefficient of friction that is designed to increase string life. Thanks to its lightweight carbon barrel and compact XLT configuration, the XLT weighs in at a well-balanced 6 pounds, 14 ounces. The Carbon Elite XLT also features TenPoint’s patented DFI (dry-fire inhibitor), clean 3 1/2-pound patented PowerTouch trigger and patented GripSafety. Equipped with the ACUdraw or ACUdraw 50, TenPoint’s patented cocking units, and the RangeMaster Pro variable-power scope, the Carbon Elite XLT is double-dipped in Mossy Oak’s popular Break-Up Infinity® camo pattern. The Elite XLT is sold only as a complete package that includes a soft case, carbon arrows, silencer kit and quiver. MSRP: $1,699 with ACUdraw, or $1,599 with ACUdraw 50. More information at www.tenpointcrossbows.com. Carbon Express has expanded its premier crossbow line with the addition of the Covert SLS, a slim-profile crossbow that allows for easy maneuvering in ground blinds and tree stands. The Covert SLS is lightweight and well balanced, featuring a green anodized flight rail, proven carbon-infused limbs on a mini-parallel CNC machined riser and premium string and cables to deliver accurate shots in the tightest of spaces. With a draw weight rated at 185 pounds and a power stroke of just 13 inches, the SLS sends a 20-inch arrow downrange at 355 fps with 119 ft./lbs. of kinetic energy. The SLS also features a Picatinny mounting system, complete with adjustable forearm and mounting grip, providing the ultimate combination of adjustability for any shooting style in a wide variety of hunting environments. The Covert SLS package includes a quick-detachable three-arrow quiver, three Maxima Hunter 20-inch arrows, a deluxe lighted scope with red/green illuminations for varying light conditions, rail lubricant and practice points. MSRP: $599.99. More information at www.carbonexpressarrows.com. Mossy Oak ProStaffer Mario Friendy tells us how being a greedy hunter can help you avoid skybusting, increase your take, and limit how many birds you "educate." 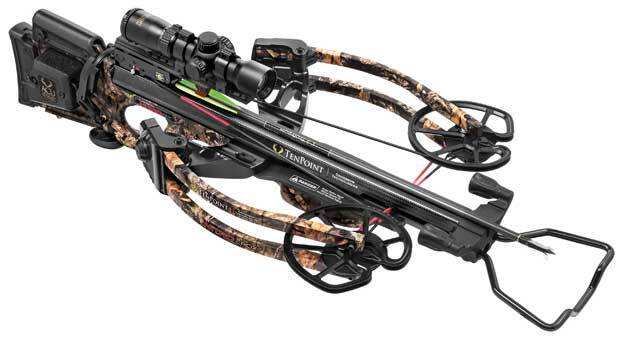 For 2016, industry leader TenPoint Crossbow Technologies, introduces its NEW Turbo GT model. One of TenPoint’s four new crossbows for 2016, the Turbo GT pairs a new stock and barrel design with the company’s time-tested technology to add improved performance and maneuverability to the newest version in a long line of successful TenPoint Turbo models. Turkey season is here and for a successful season, it’s important to stay covered. Don’t overlook the value of a facemask. ScentBlocker offers a variety of facemask options to keep you covered and concealed in Mossy Oak camo. Bowtech Archery, the industry leader in archery innovation, has launched the Carbon Icon in Mossy Oak Break-Up Country, at a price that competitors only wish they could match. The Carbon Icon delivers performance and power with every shot. The Carbon Icon is also R.A.K. equipped, which means it includes everything needed to shoot right out of the box. TenPoint Crossbow Technologies’ New 2016 Carbon Nitro RDX™ is the high-tech manufacturer’s response to the growing number of hunters attracted to reverse draw crossbow technology. New for 2016, its construction features TenPoint’s industry leading ultra-light, wrapped carbon fiber barrel mated with a newly engineered carbon stock.